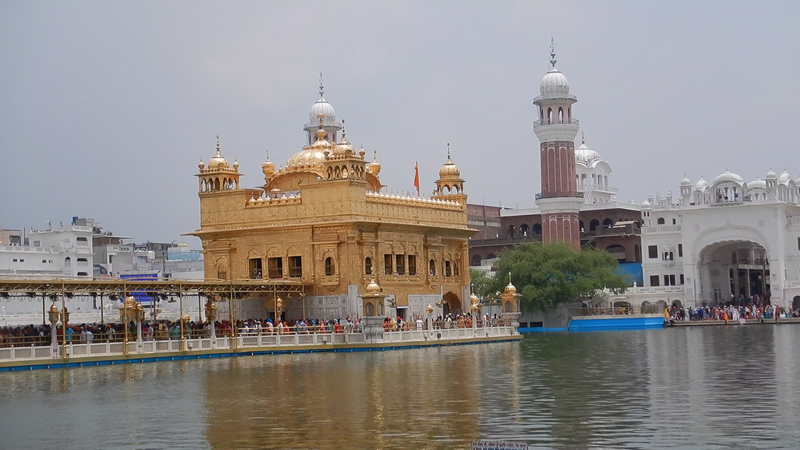 Amritsar, the capital city of Punjab state was the next in our tour of North India travel menu. Punjab has earned the nick name “Granary of India” or “India’s bread-basket” as it was one of the most cultivated state of the country from where a lot of agricultural produce came from. 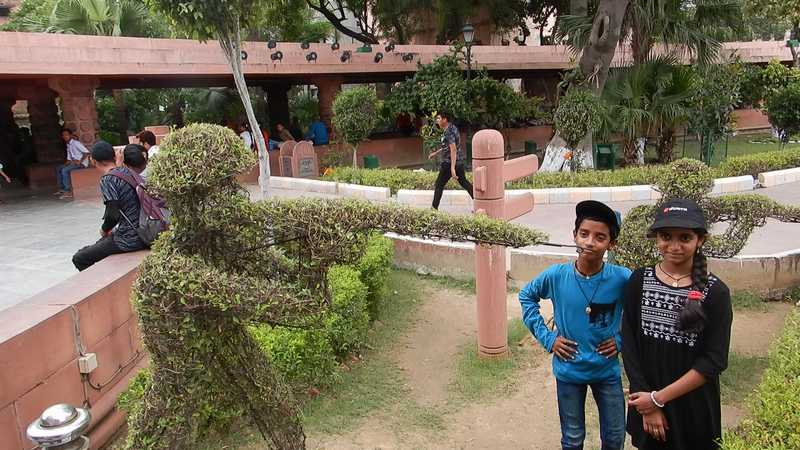 Security is very tight at the Wagah border, keep nothing on you. After the train travel from Chandigarh, we reached Amritsar in the night at around 10.30 PM. 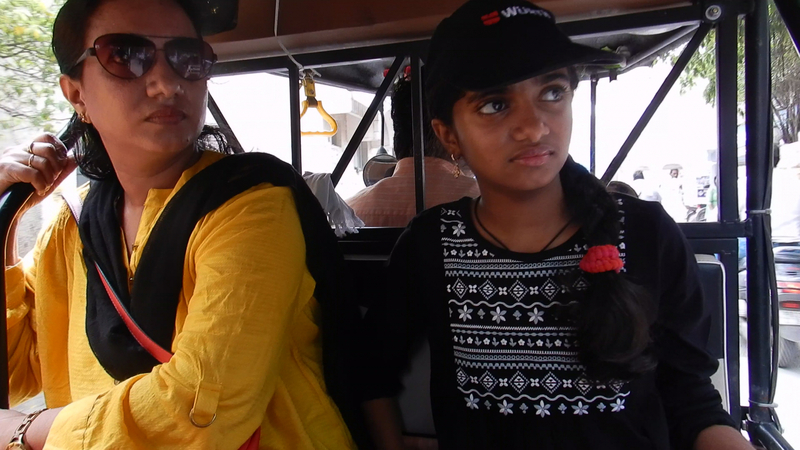 The Auto Rikshaw that we took to find the hotel unfortunately could not locate the hotel. It was another OYO Rooms hotel booking which left me upset with the OYO Rooms. They are somehow making it hard for the client to correctly identify the hotel. Hotels name itself gets changed completely to OYO, leaving it very hard to find the location even with a local driver. 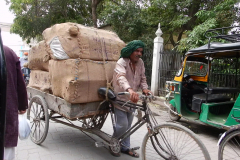 I lost my temper at the lady at the OYO’s call center who could not also direct the Rickshaw driver whom we hired from the railway station to the correct hotel. Because it was not a very nice experience to be roaming around the inner roads of Amritsar city which were mostly deserted as shops had closed by then, with the family, late in the night. These inner roads of Amritsar city, which were not so well maintained, apparently had lot of refuse left uncleared and little lighting. Finally, I decided to abandon the search for OYO’s hotel, and set off to another hotel the driver suggested. I couldn’t have done anything else in the middle of the night with family also with me. 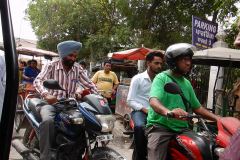 Added to that Amritsar is a bit archaic looking city which can quickly scare you in such circumstances. We finally reached a new hotel and ordered some food. I was not comfortable ordering food from outside at such late hours not knowing where the food is coming from.Room was one of the worst hotels we have occupied in the entire tour. It was not the hotels fault, but our planning’s failure in identifying a decent hotel in a well-known location. Also, in places where we had very short stays, I tried to book cheaper hotels and that didn’t work out well in Amritsar. 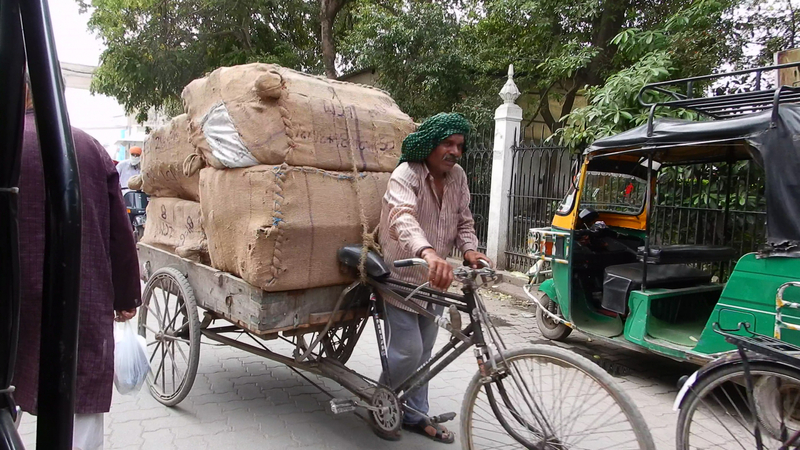 In the morning, we started another day heading to the Golden temple in a Cycle Rikshaw. 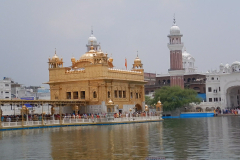 Golden temple is one of the holiest places of worship for Sikhism. 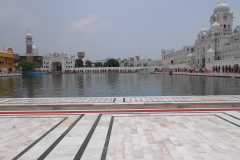 Golden temple is also known as Gurdwara or Sri Harmandir Sahib. The shrine is built around a large and stunning man-made pool where you can see beautiful fishes. Visit to the Golden temple starts with leaving your footwear under the care of the ones collecting it for you, just outside the premises of Gurdwara. Once you leave your footwear under their care and cover your hair with a towel that they will supply, take your stand in a queue leading to the main Shrine. Golden temple complex is a UNESCO heritage site and over 100,000 people are said to visit the temple every day. As we stood in the queue, climate was a bit hot. Long path towards the main shrine structure has large fans continuously operating for the comfort of the pilgrims. 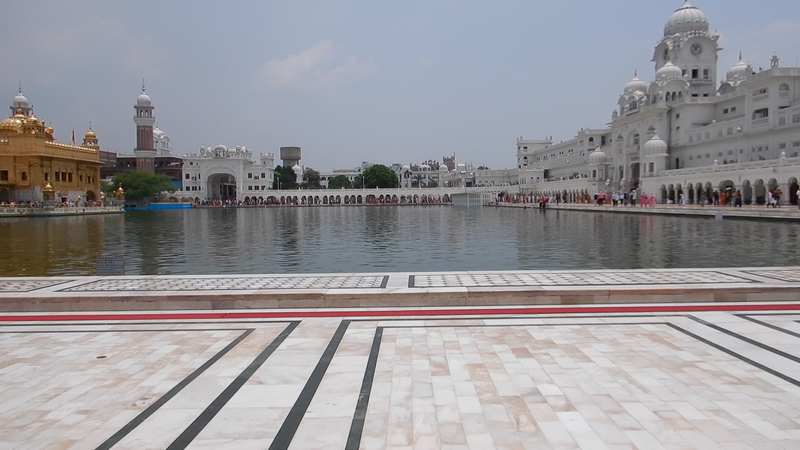 Golden temple is open to persons from any faith and that is an indication of the nobility of the Sikh faith. 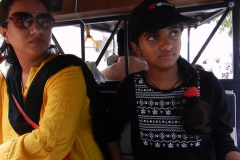 As we stood, Gayathri started to get a bit uncomfortable and required water. You must stand in a queue where the next person is just behind and in front of you and the queue moves relatively slowly as they allow only a bunch of people inside the main shrine at any point of time. We gathered some water from the crowd which comprises of people of all faiths from across the country but mainly from the Sikh faith, who were very concerned and came to advise and help us. However, her unease continued to get worse. Eventually she sat on the floor of the temple path leading to the main shrine where prayers are offered, instead of standing. We began to worry and there were not many options as there was a thick crowd of pilgrims all around us. But the people were very supportive owing to her condition and they let us move faster through the queue and towards the shrine where there was more air movement and place to sit down more comfortably. However, that faster movement was still slow as the number of people standing in the queue were large. Her condition was bad as she was feeling malaise as she could not gather the strength to standup in the queue. However, we reached closer to the main shrine faster because of the priority given by fellow pilgrims in moving up the queue. Finally, we somehow entered the shrine holding her tightly and offered the prayers at the Sanctum-Sanctorum of the Golden Temple. I knew that there were still sites on the upper stairs of the main shrine building to be visited but we called it off due to Gayathri’s condition. Outside the main shrine, there is a big area by the side of the pond where people were taking rest. We quickly moved there to attend to her. There was some pink colored sweet water (apologies for not knowing more about it) that’s given as offering to pilgrims. We all had taken several glasses of it and Gayathri’s condition started to get better though she was still not very well. There is no doubt that Golden temple is one of the most important pilgrimage centers of India where you would feel all the peace of mind that you need. If you are visiting Amritsar, Golden temple is a must visit and the temple will leave you serene for a long time afterwards. Getting someone in the group sick, was very challenging for travelers. This time, we were somehow lucky. 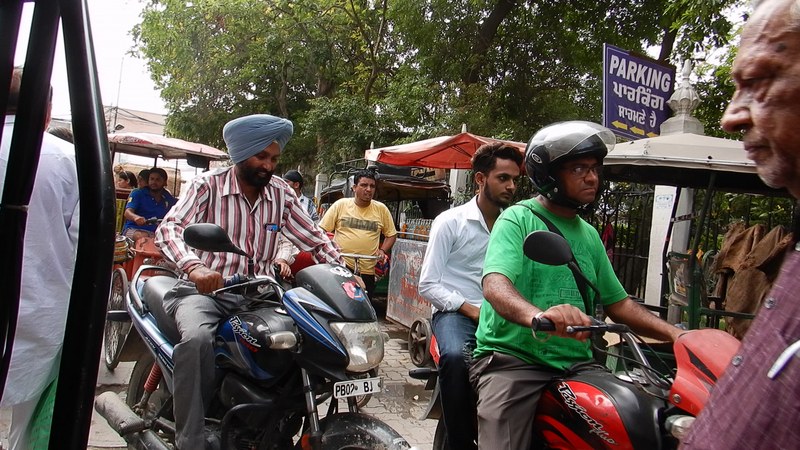 But a major health scare was awaiting us just after covering Amritsar. 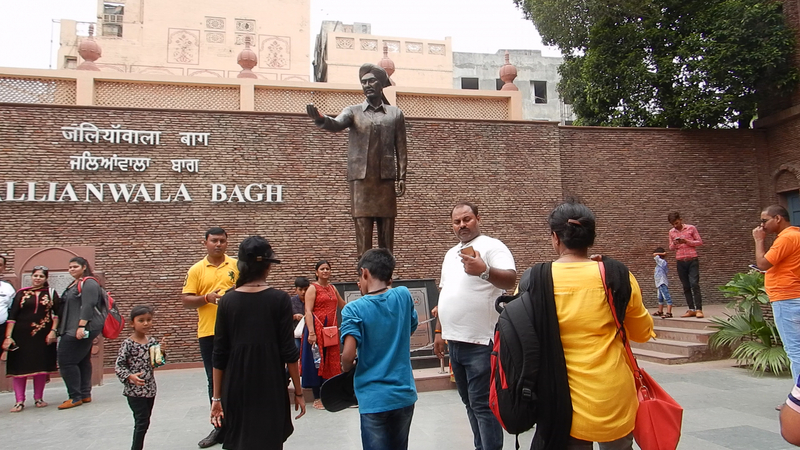 Next in the itinerary was Jallianwala Bagh. Jallianwala Bagh is a ground in the heart of the Amritsar city where people gathered for meetings before the massacre during British rule of India. Since the massacre that happened during Indian freedom struggle, the place has been turned to a memorial site. It was one of the worst episodes of the Indian freedom struggle. “The Jallianwala Bagh massacre, also known as the Amritsar massacre, took place on 13 April 1919 when troops of the British Indian Army under the command of Colonel Reginald Dyer fired rifles into a crowd of Indians, who had gathered in Jallianwala Bagh, Amritsar, Punjab. “– Wikipedia. This event in the Indian freedom struggle was a catastrophe with no parallels. I have visited the spot twice by now. But only with a heavy heart you can stand on the grounds of the Jallianwala Bagh if you really learned about the great freedom struggle of the Indian nation. 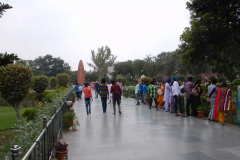 Many tourists are always present on the premises of Jallianwala Bagh. This is something I witnessed even during my last visit. Within the memorial, they have marked all that happened in writing and through art work. You can also see the well were people jumped to escape the deadly firing from the General Dyers soldiers as all the gates were closed. There are also several walls with bullet marks in the premises. If you want to know what really happened on that day in Jallianwala Bagh, I recommend you watch the movie Gandhi, Richard Attenborough’s masterpiece. To fire at a peaceful and defenseless crowd with women and children, this British officer had to be worse than an animal, because even animals kill only to eat. As seen in the movie Gandhi, when this Colonel was confronted by the investigating committee and asked, how he expected a small child who was shot with a Lee-Enfield to apply for help, he sat there stone faced still somehow condoning himself for his terrible act. If you want to see what India must have gone through as part of the freedom struggle, visit this memorial where a thousand people have died in a single incident which was one of the worst atrocities in British occupied India. Kindly turn to Wikipedia if you are interested to learn more about Jallianwala Bagh massacre. 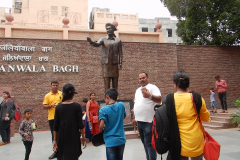 At the entrance to the Jallianwala Bagh, you can see the statue of Bhagat Singh who was Indian freedom struggles greatest revolutionary. 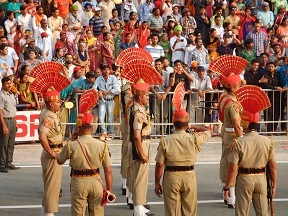 “The lowering of the flags ceremony at the Wagah border is a daily military practice that the security forces of India (Border Security Force, BSF) and Pakistan (Pakistan Rangers) have jointly followed since 1959. The drill is characterized by elaborate and rapid dancelike manoeuvres and raising legs as high as possible, which have been described as “colourful”. It is alternatively a symbol of the two countries’ rivalry, as well as brotherhood and cooperation between the two nations.” – Wikipedia. 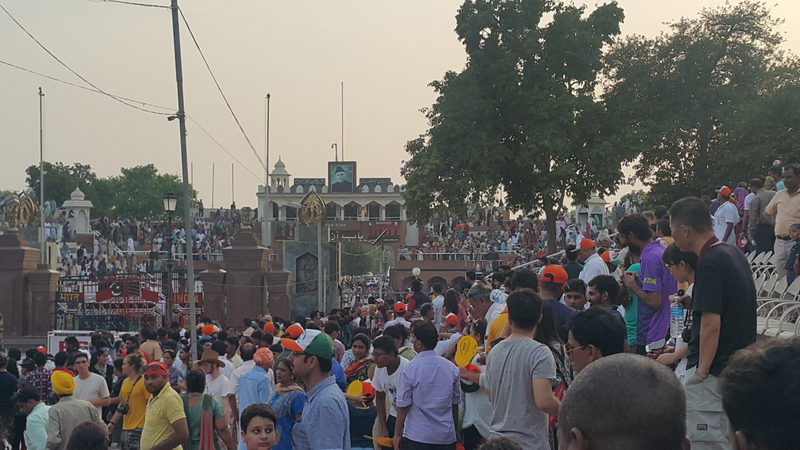 Wagah-Attari border is about 30 kilometers from Amritsar city. The ceremony described above is visited from people across the world as it is one unique show by two rival militaries. My language will fall short to describe to you exactly what happens for approximately two hours during which the whole show is conducted. However, pictures and videos I shall include here will be a better way to get you the idea. 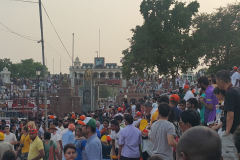 Before we were about to enter the Jallianwala Bagh at around 12 PM, I was worried how to travel to Wagah border ceremony quickly after that visit. Before we entered, a person approached us stating that he drives people to Wagah in a cab and I could book the cab now. The agreement was that he would meet us in two hours’ time outside the Jallianwala Bagh. I think I gave him about Rs. 100. But when the scheduled time came, there was no sign of the Guy. 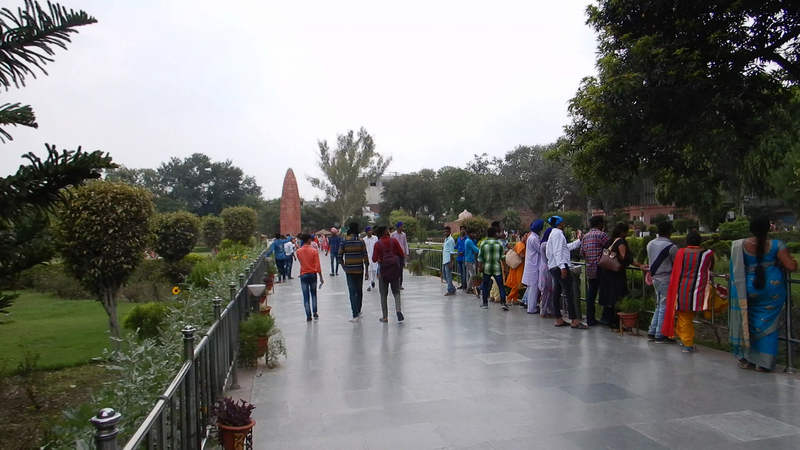 We waited for about 30 minutes after a food in a good restaurant outside the Jallianwala Bagh. After thirty minutes, we set off to Wagah border in an Auto Rickshaw though it was not very convenient, that was the only vehicle quickly available. 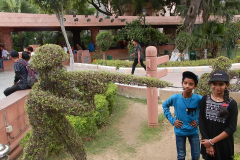 Not only that I felt cheated, precious time when we could have grabbed a better seating at Wagah border Gallery was lost. Every travel, you will have to be prepared for such situations especially if you are setting off alone not depending on a package tour. See how, difficult it is to determine how honest people are, my intuitions have clearly failed me here. Please understand that you are entering a ceremony where two rival militaries are staging a military personnel’s show. Almost nothing of your personal belongings will be allowed, and you will be most thoroughly body checked before entering the venue. Except your money purse, nothing else will be allowed into the ceremony venue. Please do your own investigations to find out more but it will be better to carry as little essentials with you as possible before you leave. I have carried my camera and the phone, which is allowed. However, kindly do your own investigations on this, to understand any latest rule change. In fact, as I mentioned earlier, though the core ceremony lasts only about 45 minutes as mentioned, some additional features such as groups running with Indian flag and some dancing to the patriotic songs commence earlier. Thousands of people come to see the ceremony that’s conducted every day. Hence it is better you leave sufficiently early so that a good seat close to the venue can be occupied. The gallery was relatively small when I visited in August 2015. But in 2018, the gallery has been rebuilt and is much bigger. We are back at the Amritsar Airport by around 9 PM to catch a flight back to Delhi. The luggage that was left at the hotel, which was already vacated, was picked up on the way to the airport. We had some dinner at the Airport as we were constrained for time. If you want to make your visit, unhurried, at least two days would be required at a location. But with our whirlwind tour plan considering the large number of places to cover, that was out of question.